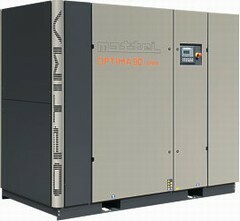 86 through 126 SCM: Mattei's Direct-Drive BLADE Series sets a new standard in industrial grade air compressors with high-efficiency performance, quiet dependable operation and low maintenance. Featuring quiet (as low as 67 dB(A)) cabinet enclosures, electronic controllers, energy saving soft-start Wye-Delta motor starters, premium efficiency TEFC motors, air-cooled aftercoolers and optional heater kit for low ambient (down to +14°F) temperature protection to protect against freezing. 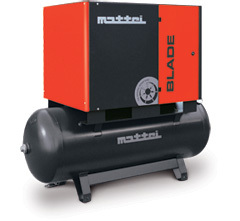 Direct-Drive BLADE Series combines the best features of Mattei’s legendary direct-drive “bearingless” air compressors (direct-drive, quiet cabinet, phase reversal protection and, continuous, automatic and modulation control, moisture separator and zero air-loss automatic drain (shipped loose), 10 year RSU “airend” warranty) and blends it with the best of the BLADE belt-drive compressors (spin-on oil and separator filters, tri-voltage single-shaft motors, Maestro XB controller with Expansion Module/clock card for networking or setting start/stop times, radial cooling fan) in creating a new industrial class product at a great price. Simple design and long-life components couple with our legendary slow operating speeds deliver the longevity that only vane technology can deliver while producing lots of air with minimal energy costs. Features our Maestro XB microprocessor-based controller with Expansion Module/clock card for networking or setting start/stop times, and Continuous, Automatic or Modulation operating to most efficiently match your unique air demands. Direct-Drive BLADE features true shaft-to-shaft input power in turning the compressor at 4 pole (1,800 rpm @ 60 hz) motor speds. The high-efficiency TEFC C-faced motor is direct-coupled to the compressor shaft via a flexible coupling that is engineered for fast and easy element replacement without having to uncouple the drive train. 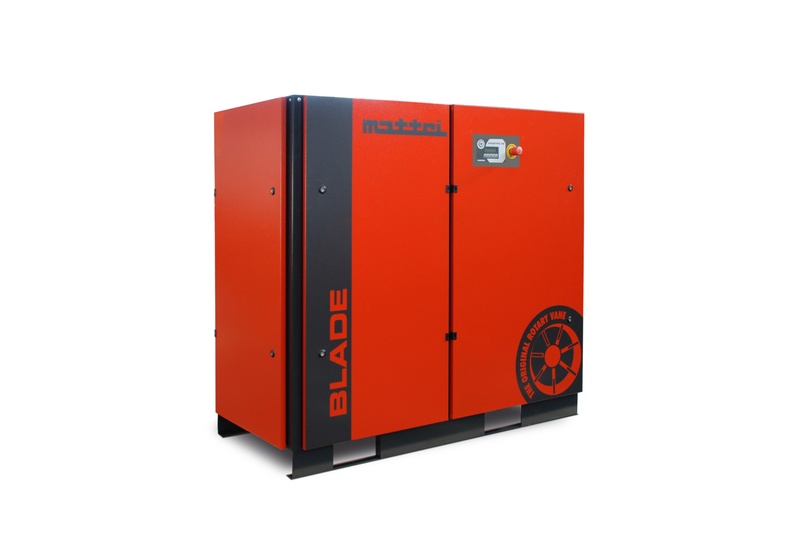 BLADE Series compressors are housed in a powder coat painted stainless steel cabinet. The slow rotating speeds of our vane technology deliver sound levels as low as 67 dB(A). 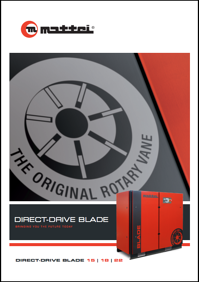 Direct-Drive BLADE features our proprietary single-rotor stator unit (RSU) that incorporates our legendary white metal Babbitt bush in lieu of the ball and/or roller bearings common on rotary screw compressors. Mattei's Direct-Drive BLADE compressors are engineered for 24-hour-a-day service and are backed by a 10-Year airend warranty in addition to featuring our exclusive Meehanite® cast iron blades designed to last 100,000 hours. 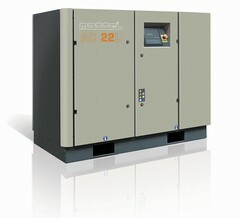 The demands of every air system are unique, which is why Mattei provides you with three different control schemes (Continuous, Automatic, Modulation) to choose from to best adapt air production to the demands and dynamics of your specific air use. The Direct-Drive BLADE Series features the state-of-the-art Maestro XB electronic controller to automatically control the compressor. The heart of Mattei's legendary pressure stability over time begins with our exclusive hydraulically-controlled inlet valve, which, unlike competitive pneumatic control circuits, ensures consistent and reliable pressure regulation over time. Modulation mode automatically adjusts the intake air opening to match output to air demand. It keeps pressure stable within a ± 4-5 psi range. 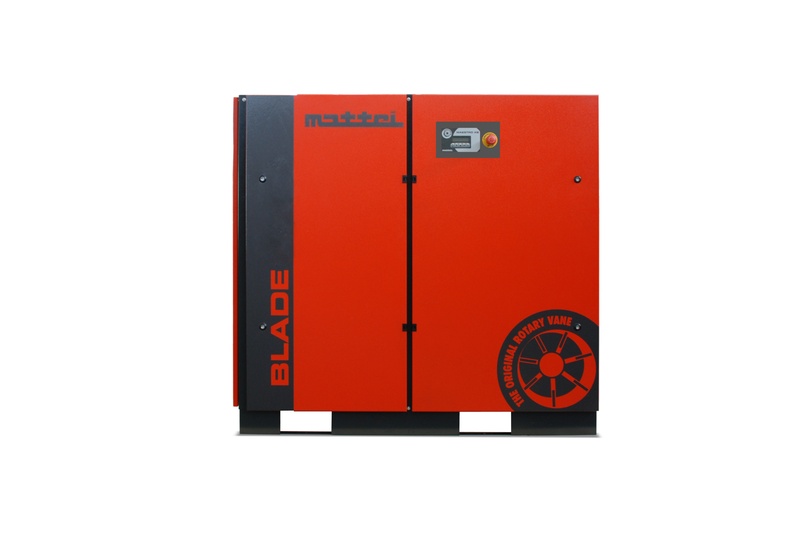 Ideal for applications with little storage and large variations in demand and applications where the compressor runs near full capacity most of the time. Direct-Drive BLADE models are equipped with premium, efficient, totally enclosed fan-cooled TEFC electric motors as standard. Energy-saving Wye-Delta motor starters is standard on Direct-Drive BLADE Series. 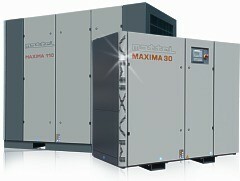 Built-in Air cooled aftercooler with 18°F approach temperature. Every Direct-Drive BLADE Series compressor comes with a moisture separator with automatic zero air-loss condensate drain as standard shipped loose for field installation. 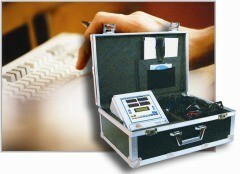 All components are easily accessible for fast and easy maintenance. Direct-Drive BLADE Series features quick-change air filters and spin-on oil filters and air/oil separator filters for quick and easy maintenance. Genuine Mattei parts and oil combine with long operating intervals to deliver significant savings over the life of the machine. The Heaters Kit option has been engineered to allow you to place the compressor in an ambient as low as +14°F and protect the internal cabinet from freezing. 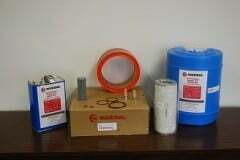 The Heat Recovery Kit is a secondary fluid circuit that allows you to pre-heat process water using the heat generated by the air compressor to reduce water pre-heating costs. It is totally integrated into the oil cooling circuit, making the unit independent from the oil temperature control and protecting it from any possible malfunctions, such as water flow reduction and overheating. Maximum outlet water temperature 149-158°F. 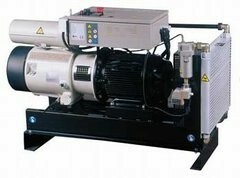 Mattei offers comprehensive air treatment accessories to complete your air system including: in-line coalescing filters, refrigerated air dryers, desiccant air dryers, sterile in-line filters, air receiver tanks, timer and demand style condensate drains, and oil/water condensate separators. 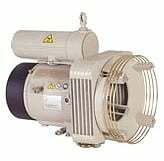 During the compression process, air is drawn through a filter into the "Rotor-Stator unit” (RSU) which consists of a cylinder (stator) in which a rotor mounted eccentrically and tangential with the stator rotates. The rotor has longitudinal slots in which vanes slide. Vanes are pushed against the stator internal surface by centrifugal force, generated by rotation. Air is compressed through the contraction in volume of the chamber, consisting of the stator, vanes and rotor, during rotation. Sealing between the moving parts, cooling and lubrication are ensured by oil injection. At the exit from the RSU, the air-oil mixture passes through a filtering element, separating oil from the air, this oil is then recovered and returns to the intake. The air-oil mixture leaving the compression unit passes through a separation chamber where velocity slows and gravity returns the bulk oil to the oil reservoir. 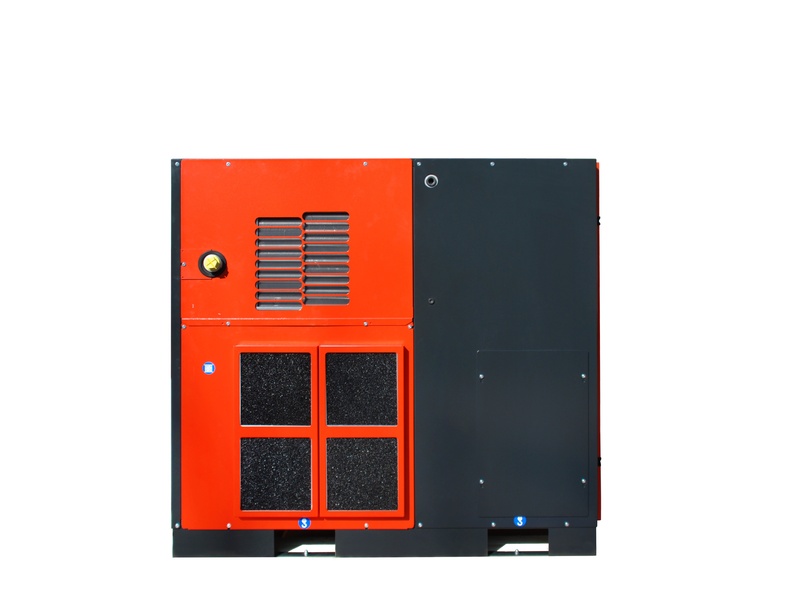 The air and remaining oil aerosols then pass through a high-efficiency air/oil separator coalescing filter that remove almost all oil residuals from the air. By passing through mechanical and coalescing separation stages, the mixture of compressed air and oil is purified until the maximum oil carry-over in the air does not exceed 3 ppm (parts per million). 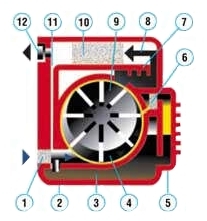 A cooling air flow produced by an auxiliary fan passes ambient air through the compressor cabinet and removes heat from the oil cooler generated during the compression. Compressed air leaves the compressor through a valve, which has the function of keeping a minimum pressure inside the oil chamber, so as to ensure suitable operation when the compressor is delivering air.